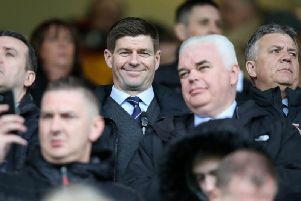 IT MAY take some time for a feelgood factor of significant substance to be restored to Ibrox, but Rangers at least took another positive step on the road to redemption in front of their own supporters last night. This now traditionally emphatic win over Dunfermline Athletic, secured by four goals in an eye-catching and almost possessed opening period by Alex McLeish’s team, maintained the momentum created by Saturday’s victory over Dundee. But the victory came at a price as Frank de Boer hobbled off with an ankle injury in the dying minutes of the match and the Dutch defender is now a doubt for Sunday’s Old Firm match. McLeish said: "Frank has a swelling on his ankle and if it is no better in the morning then he’ll be fighting a battle to be fit to face Celtic." Whatever gameplan Jimmy Calderwood and Jimmy Nicholl had concocted for their trip to Govan, the concession of a goal inside the first 90 seconds would not have been in their script. Alan Hutton’s delight in claiming his first goal for Rangers in only his third appearance for the first team contrasted starkly with the dismay in the visiting technical area at the timid defending which allowed the young full-back to rise at the back post and meet Ronald de Boer’s corner kick with a firm header to beat Derek Stillie from close range. Rangers doubled their lead in 11 minutes with a fine goal. Peter Lovenkrands sped forward again, exchanging passes with Gavin Rae on the edge of the area, then lashed a first-time volley beyond Stillie’s right hand for his 13th of the season. The Pars goalkeeper made a terrific save to prevent Lovenkrands adding a third and, briefly, it looked as if it might be significant when the visitors immediately advanced up the pitch to score with their first real attack of the night. Barry Nicholson’s cross from the right picked out Andy Tod at the far post, the big defender unmarked to the fury of Rangers keeper Stefan Klos who berated his defence after watching Tod’s header sail into the corner of the net. It hinted at continuing vulnerability at the back for Rangers, but it proved inconsequential on this occasion as they resumed the offensive and subjugated any notions of a Dunfermline comeback with two terrific goals in the space of three minutes. Lovenkrands, showing an appetite he often lacks, left Greg Shields standing with a mazy dribble into the penalty area before cutting the ball back to Stephen Hughes. The midfielder fed a pass to Ronald de Boer, who beat Stillie with a curling right- foot shot from around 14 yards. The Dutch forward, displaying his best form since returning from injury, then turned provider with a cute reverse pass to Michael Mols, who produced a trademark swivel-hipped turn before beating Stillie from close range. Mols might have added two more before the break, forcing a good save from Stillie then flicking a cross from the impressive Hutton narrowly wide, but Rangers jogged to the dressing-room to a warm ovation. Even the eternally adventurous Calderwood, who had replaced defender Tod with Craig Brewster seven minutes before half-time to lend more support to Stevie Crawford up front, would have realised this was already simply a damage-limitation exercise for his team. Rangers, who withdrew Ronald de Boer at the start of the second half and sent on Steven Thompson, carried less urgency and menace as they perhaps, even subconsciously, began to divert their attention to Sunday’s Old Firm clash. While Dunfermline enjoyed an increased share of possession, however, Rangers carried the greater threat and Thompson was unfortunate to see a header fly narrowly over. McLeish made another change in 62 minutes when Lovenkrands was replaced by Chris Burke. The winger’s arrival meant Rangers now had no fewer than six Scots on the pitch, a startling departure from the underachieving, native-free zone the Ibrox team have been too often in the recent past. Even when the home manager did send on another import, replacing Mols with Danish teenager Bajram Fetai, the accent remained firmly on attempting to build for a more profitable future. Rangers: Klos; Hutton, Khizanishvili, F de Boer, Ball; Rae, Malcolm, Hughes; R de Boer (Thompson 46), Mols (Fetai 72), Lovenkrands (Burke 62). Subs not used: McGregor, Vanoli. Dunfermline Athletic: Stillie; Skerla, Wilson, Tod (Brewster 38); Shields, Nicholson, Darren Young, Mason (Mehmet 83), Labonte (Byrne 46); Crawford, Derek Young. Subs not used: Ruitenbeek, Dempster.